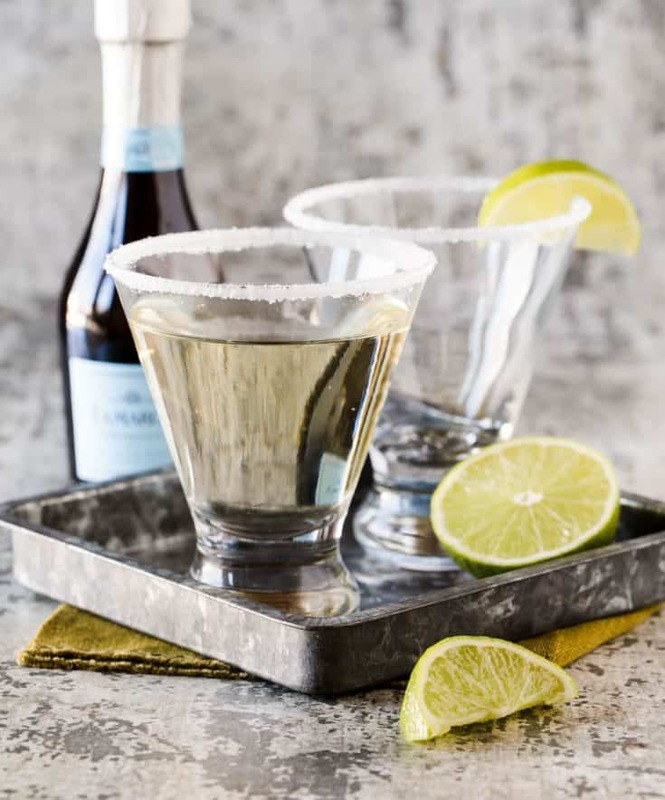 Add some cheer to your party menu with this wildly popular Gin, Elderflower and Prosecco Cocktail! Simple truth: Everyone loves bubbles. And drinking bubbles with friends and family makes them even better. Ever get tired of the same old drinks, but don’t want to serve something that has a ton of ingredients and is putzy to make? 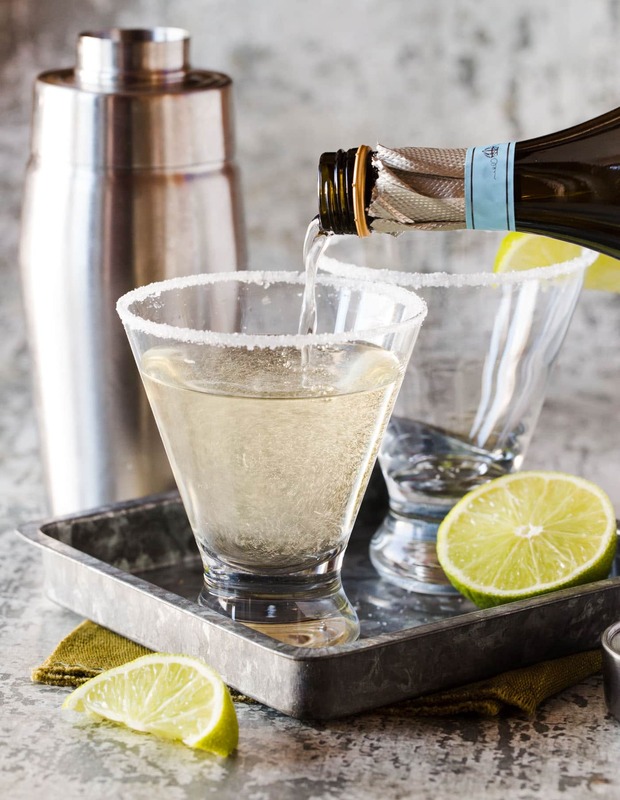 Then this Gin, Elderflower and Prosecco Cocktail is just what you have been looking for. 5 ingredients are all you need before you are on your way to cocktail heaven….and that includes the garnishes! What is Elderflower Liqueur and what does it taste like? Elderflower liqueur is made from the small, white flowers of the elderflower bush. These blossoms are often handpicked and the liqueur is made with no preservatives or stabilizers (which means it really should be used in about 6 months for best flavor). The liqueur has a delicate floral flavor that is more subtle than you’d expect. Since elderflower liqueur is rather sweet, you can easily use it to replace other sweeteners in your cocktail recipes like simple syrup, agave and maple syrup. Does it matter what kind of gin I use in this cocktail? Why do I need the sugared rim on the martini glass? Usually garnishes are just for looks, but this is one drink where they really complete the cocktail. That sparkly sip of sugar makes this cocktail extra fancy. Fortunately, sugar garnishes aren’t a lot of work. Simply pour sugar on a small plate. Run a lime wedge around the edge of the martini glass and then dip the juice-coated rim in sugar. Voila! Instant sugar rim! All that’s left to do is a squeeze of lime juice and you have a fancy-looking cocktail that looks as impressive as it tastes. Looking for a stiff drink? Add just a bit of Prosecco. Want a lighter drink? Be generous with your bubbles. Anyway you pour it, you can’t go wrong. Looking for more ways to use Elderflower liqueur? Check out our collection of elderflower cocktail. Elderflower liqueur is one of our favorites! Bubbles are always a hit! Here are some more cocktails we love! I’ve never had elderflower before! But this cocktail looks like the perfect way to ring in the New Year! Pinned! What a lovely sounding cocktail. I’ve been meaning to try Elderflower Liqueur and now I think I know just what to do! This looks perfect for a NYE celebration! Oh how festive! 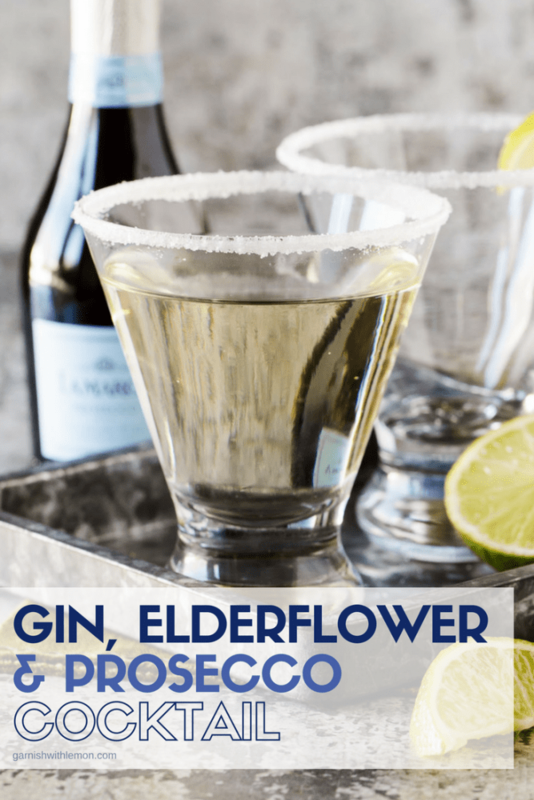 Nothing beats Prosecco for festivities, and I LOVE Elderflower, so this sounds wonderful! Merry Christmas! We would drink well together 🙂 Merry Christmas to you too! night with this cocktail as our main drink. Can’t wait – and neither can they!!! I’m SO happy you liked them! It’s such a delicious combination! Cheers!